I’ll see your town in Provence and raise you one splendid city built of travertine limestone in Italy. I’m sure the ingrained rumors of French indifference toward foreigners aren’t really true, especially in Provence, where warm smiles and genuine hospitality are the norm. But Italy—ah, la bella Italia—knows how to welcome and seduce her visitors. A glass of wine, a fabulous leisurely meal, the golden sunlight and relaxed lifestyle—you can’t help but be easily smitten. The central region of Le Marche holds many allures, cozying up to Tuscany and Umbria as it does, and its gorgeous and livable city of Ascoli Piceno is a great place to call home. Ascoli lounges in a sunny valley at the confluence of two rivers, sitting happily between the Sibillini Mountains and the Adriatic Sea. 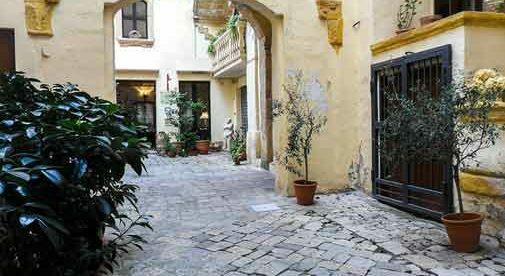 Ascoli has not one, but two grand piazzas, decked out in elegant travertine, perfect for a passeggiata or people-watching. The Piazza del Popolo is considered one of the most beautiful squares in Italy, with Renaissance-era arcades, stylish shops and historic cafés, all anchored by the majestic church of San Francesco. This is the place to enjoy an aperitivo with friends before dinner. It becomes a concert venue in the summer. A luxurious opera house provides more intimate shows in a velvety setting, with viewing boxes outlining the oval interior. Squiggly cobbled lanes wend through the medieval historic center with skyward-reaching towers scattered about, giving the city its nickname: City of a Hundred Towers. But don’t think they neglect trees and nature. There is a nice pathway along the Castellana River and a wooded park on Annunziata Hill to enjoy. Everyone circles the city on bicycle. 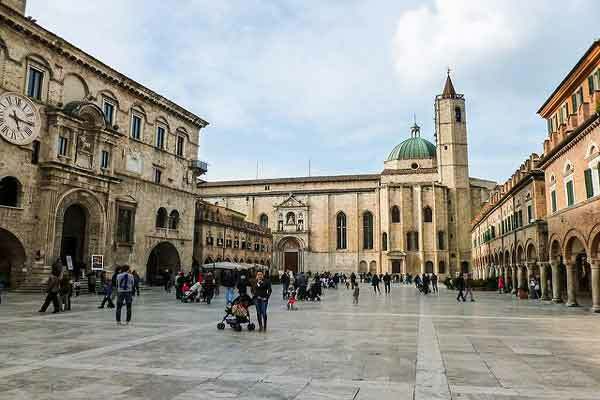 A gorgeous airy cathedral with opulent artwork, palace-dotted streets, a handful of museums, a produce market in the church’s cloister, art exhibits amid Roman ruins, and loads of great eateries give Ascoli Piceno a lot to enjoy. It is, in short, a great lived-in city that worries less about attracting tourists and more about providing a good civic experience to its residents. The countryside surrounding Ascoli Piceno is classic postcard landscape with hillsides swathed with a checkerboard quilt of staked-out vineyards, silvery olive groves, cultivated fields, and vibrant yellow splashes of sunflowers. Excellent wines, good country restaurants, and charming hill towns typify the province. The beaches of the costa delle palme at the Adriatic Sea is a palm-studded stretch of powdery sand just a half-hour from Ascoli. All that quality of life doesn’t break the budget, either. Since the city is still relatively unknown, property prices haven’t skyrocketed. A restored two-level apartment in the historic center with wood beams, wood floors, a modern kitchen, and a terrace is going for just about $207,000. Another apartment in a prestigious palace in the heart of the city with a bright interior and spacious panoramic roof terrace is priced at $321,000. A three-story townhouse with a fireplace in a quiet corner of the centro is also $180,000; sure, the kitchen needs updating, but it’s a great find with 135 square meters of living space. If you prefer to be in a country cottage, I spotted a gorgeous old stone farmhouse with a gourmet kitchen, swimming pool, and eye-popping views of hills and fields for $394,000. So go to Provence for vacation and walk among the lavender fields, but Ascoli Piceno is a real place to call home with all the beguiling qualities Italy has to offer consolidated into one grand city.